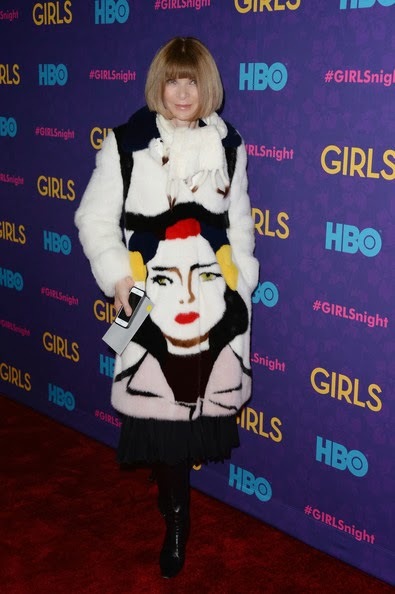 Anna at the Girls Season 3 premiere, January 2014. Photo by Andrew H. Walker. She’ll always have the Met. It was announced yesterday by The Metropolitan Museum of Art that the newly renovated galleries for The Costume Institute will be renamed The Anna Wintour Costume Center. It opens May 8, 2014 with the inaugural exhibition Charles James: Beyond Fashion (and oh yes, I will definitely be there). The complex is being named in Anna’s honor because of all her efforts to raise money ($125 million to be exact!) for The Costume Institute since 1995. It made me laugh last year to read the speculation that Anna was hoping to be made an ambassador to England after Obama’s re-election campaign, in thanks for her fundraising efforts with his second presidential bid. Why would she ever want to be ambassador to England when she is the Queen of the Fashion (and Magazine Publishing) World? Even when she is no longer Editor-in-Chief of Vogue, Condé Nast named her as Artistic Director over its entire organization, and now the chief wing of The Costume Institute, with its exhibition galleries, library, conservation library, research areas, and offices will bear her name. I’d take all that over an ambassadorship too. Talk about power! Photo by Andrew H. Walker/Getty Images North America. I am kind of digging the coat she recently wore to the Girls Season 3 premiere. Let me know what you think of it. 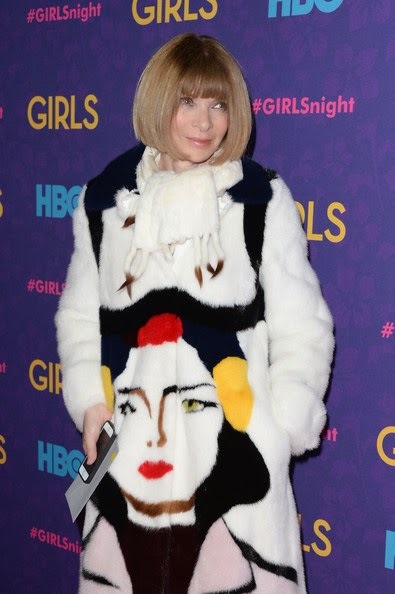 Love Anna, but not real sure about that coat...not my style. Interesting though, thanks for sharing! Thanks Jill for all this kind of news you share with us! I didn't even recognize her - all I saw was the coat. Well, I wouldn't buy it, but it does have high recognition value! And I guess that's what it's about these days - people to remember who wore what. Or? Haha, Ambassadress Anna? Does she need to be diplomatic in her present jobs??? I guess it's good to be Anna! What a life she has. That coat is nothing if not eye-catching! Not just power...but way more fun!! Who would leave what she has for political strife! Thanks for sharing this, Jill!! She seems to have earned the building named after her. The coat is oddly out of character, though I suppose it works. I wouldn't wear it! I like the coat; I'm glad she stepped outside her usual. Something someone in fashion SHOULD do. On fashion police, Joan trashed it but all 3 others liked it. Me? I'd wear it--its fun! Hi everybody, thanks for the great comments, it's interesting to read what people think of Anna, in general, and her coat, in particular. I think it's wild and I'd kind of like one night to step out in it!